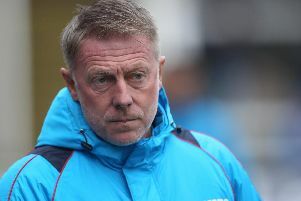 Craig Hignett hopes the skill and intelligence of his players will make Hartlepool United difficult opponents for their League Two rivals to fathom out. The Pools boss tweaked his approach in Tuesday night’s 6-0 friendly win at Guisborough Town. Hignett operated with skipper Billy Paynter and two of his summer signings, Lewis Alessandra and Padraig Amond, as his attacking trio. It worked like a dream with the trio contributing five of the goals, plus four assists in there too. The fluidity was the key, Alessandra, especially, providing a lot of difficulty for the Northern League opposition. “We played slightly different on Tuesday night,” he explained. “Billy and Podge [Amond] played up front and we looked a lot better, we looked more threatening than we did on Saturday at Livingston. “We had lots and lots of chances and scored some great goals. “We’ve used these pre-season games to try different things and it clicked at Guisborough, the football was really good. “The front three were excellent all night, especially their movement, coupled with the movement in midfield. “It was a really good performance. “I liked the rotation of the players. “I want us to be hard to play against, I want opponents to be thinking ‘where’s he come from?’ – and we did that. “The flip side to that is defensively everyone has a job to do an d because we are so free-flowing, we have to make sure that is nailed down. “Everyone has to know what to do when we lose the ball. “I want to play different formation, different ways. Next up for Pools is a tough friendly with League One Scunthorpe at Victoria Park on Saturday. It is, potentially, an opportunitry for Hignett to operate the same system against the Iron, with the League Two curtain-raiser seven days later against Colchester. “Pre-season is all a little bit trial and error,” he said. “We worked on that shape for a couple of days and while there are bits and bobs we need to iron out I think the lads understand it.